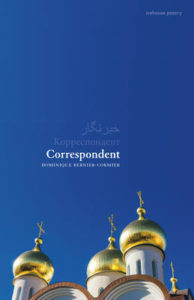 I recently finished reading Correspondent by Dominique Bernier-Cormier (Goose Lane, 2018), which is a fascinating first book. It’s autobiographical, recounting the author’s adolescence – as one usually expects from first poetry collections – but it does so slantwise. Bernier-Cormier refers to his upbringing in hints and flashes around the larger political events which dominated the news, and his life, at the time (his father was a CBC correspondent in Moscow). So the sinking of the Kursk and the Nord-Ost siege become intertwined with Russian lessons in school, car rides through new neighbourhoods, memories of Canada, and visits to Central Asian marketplaces. It’s a very powerful portrait of a time, a place and, tucked within it all, a person. More generally, I’m very excited about all the debut poetry books coming out from BC poets (or adopted BC poets who wrote their books while at UBC), including Joelle Barron (Ritual Lights), Nicholas Bradley (Rain Shadow), Aiden Chafe (Short Histories of Light), Curtis LeBlanc (Little Wild), Mallory Tater (This Will Be Good), Shazia Hafiz Ramji (Port of Being) and Laura Ritland (East and West). And forthcoming first collections by Daniel Cowper, Shaun Robinson and Matthew Walsh (and many more, I’m sure, who I’m missing). It’s an exciting time for poetry here on the west coast – all our secrets are spilling out for the rest of the country to learn about!